Is there enough food and drink in a supermarket to last a lifetime? Would there be enough food and drink in the average, major supermarket to sustain a single adult for the rest of their life? And if there's not, is the problem that there's not enough food (ie calories) or that there's not enough drink (ie water)? I'm imagining such a scenario arising after a nuclear war or pandemic, so there would be no power and the frozen/refrigerated food would spoil. Even canned food will only be good for 3-4 years, after that, in a post apocalyptic scenario it would be a russian roulette of dying from some terrible intestinal ailment caused by food poisoning. Most everything else will spoil in between 1 week to 6 months. There would by definition be enough to last the rest of this hypothetical person's lifetime. The question is how long that lifetime would be. I'd imagine much shorter than pre-disaster expectations. I doubt a twenty-something in this scenario would live to see 70, for example. In this scenario could you plant the seeds in the grocery store and harvest the result? Could you use the food as bait to catch animals then butcher and salt them? Could you use the bottles and containers to create a solar water-distillery? Spoilage would be the major issue. A large amount of the fresh and frozen food there would simply go bad before the average person could eat it. So you'd lose a lot that way. Even canned foods have a maximum shelf life in good storage conditions of about 5 years. Then you have dry goods like pasta and rice and beans. Apparently even these will lose a lot of their nutrition value after 5 years. So you wouldn't have enough food for the rest of your life. There might just be enough calories if none of the food went bad. Assuming an 18 year old who would live to be 75, you'd need to provide 37.5 million calories (average of 1800 calories per day) over that time period. Consider the million calorie burger. You'd need to have 37 and a half of those to make it. Now when it comes to water, you need three-quarters of a gallon a day. That's quite a bit, as in 275 gallons a year (a lot of gallon jugs). Even if you accounted for all the soda as well, I doubt there's enough water in the place to last much more than one year. So you're right: water would be the limiting factor. Canned food is guaranteed to last for 3-4 years generally, but it actually lasts much, much longer in under most circumstances; some 100 year old canned food has been tested and been found safe to eat, though perhaps not delicious. And, people can survive not-very-much food (starvation diets, essentially), especially if they don't need to move around very much. So, I'd guess that a full supermarket could last a single person a VERY long time, though I really don't know how long. Now when it comes to water, you need three-quarters of a gallon a day. You don't need to drink all that water, you get most if not all you need from the food you're eating unless you're working out in the hot sun. Otherwise it's quite possible to get by without drinking water directly. Also, you do not need to take in very much water as water if you are eating foods with high water levels, like canned foods. You need to take in significantly more water if you are eating dry foods, like crackers. And the amount of water a person needs varies significantly with the weather and with exercise levels; just think about what you drinking running around on a 90 degree dry-heat day vs. what you drink sitting inside on a foggy, cool day. So, I think the variability of conditions makes it hard to estimate how long supplies would last without more specifics. Would there be enough food and drink in the average, major supermarket to sustain a single adult for the rest of their life? By definition, yes: an adult can live in a supermarket until they run out of food or water and die. Do you mean, enough to sustain an adult human for the rest of their ordinary lifespan, such that they will die of something other than malnutrition or dehydration? No. A human requires +/- 2 liters of water per day, on average. Absent urine filtration, you're not going to have enough water even if you do have enough food. As well, humans need a lot of the right kinds of food, and that food is primarily perishable (lots of produce). You can live on crackers and cookies and other shelf-stable carbs for a while, but you'll be depleting your stores of vitamins and trace minerals and so forth. You'll get, among other things, scurvy. Not all calories are equal, calories are by no means the whole picture of what a human needs, and human nutrition is not simply a matter of stockpiling enough calories in whatever form you can find them. Over the time it takes to consume it, 50,000 kCal of fruit is going to affect a human differently than 50,000 kCal of meat, which will affect a human differently than 50,000kCal of sugar. Can you process the foods to make other foods? For instance could you go straight for the apples in the produce section, juice all of them, and ferment said juice to make cider? Which would theoretically have a decent shelf life? Also potentially other beverages that could be made with the produce and dairy products before they spoiled? Someone earlier mentioned using seeds and growing food with it. Our supermarkets here have a lot of stuff, including some potting soil. My guess is you could get access to the roof, collect rainwater, plant crops up there, etc. So yeah, I think you could live out the remainder of your natural life in (or on top of) a Supermarket. A person eats 60,000 pounds of food in their lifetime. A supermarket gets several trucks of food a week, carrying 20-50,000 pounds each. So it seems to me the numbers are just about the same. It depends on spoilage, whether the person carefully rations, and those kinds of details. Grocery stores often carry things like small charcoal grills and the charcoal and lighter fluid, so you could use up the perishables first by cooking or even baking or smoking if you could rig up something over a fire. In terms of pure calories there is almost certainly enough for an individual to survive. Any well-stocked supermarket is likely to have (either on the shelf or in the warehouse) 5 to 10 million calories in pure sugar alone, which is unlikely to spoil. Add in other sugar-rich foods such as candy and you'll not run out of energy this side of 50 years. Nutrition, however, is something else entirely. Also, the supermarket will have hundreds of liters of cooking oil, which is incredibly high in calories and has a decent shelf life. I think I would rather be killed in the apocalypse than spend the rest of my days chugging oil, but hey, losers can't be choosers. Would the hypothetical inmate of the supermarket have to fight rats, mice, and insects in this scenario? I imagine that in any apocalypse, they would take over pretty quickly. What happens to the spoiled food? Does the hypothetical inmate of the supermarket have any way to dispose of all the food after it goes bad? Things could get really disease-inducing if the people are stuck inside with a lot of rotten meat and vegetables. A supermarket will also have a nice big aisle of vitamin pills. A few dozen one-year bottles of one-a-days will go a long way towards ensuring your nutritional needs are met. And the honey, if well-sealed, will last for centuries. A supermarket is going to have an aisle with vitamins and other supplements. Even a small one-a-day vitamin bottle has a two months supply. Each tablet has 100% of vitamin C requirement. There will be probably be bottles of just vitamin C tablets as well. I imagine a well stocked supermarket could at least prevent scurvy for a really long time. I don't know about any of the other deficiencies that would come about due to less than 100% RDA or not being present in vitamins at all. I think the availability of water depends on the parameters of the question. If you're only limited to what's in the supermarket, you'll probably run out of water sooner rather than later. Googling seems to suggest that something like a brita water filter is no help for filtering urine, though the consensus seems to be that it's already drinkable (just horrible). And you'd have no shortage of storage containers for it. If you have access to the supermarket roof and rainwater is available and potable for you to be able to put down dozens/hundreds of containers to catch it, then I think you'd be able to survive for a very long time. Water filters in the supermarket might be able to help with this, and/or supplies to boil it (matches etc) assuming you can gather fuel for a fire, either from within the store or outside. Any large supermarket is going to have a lifetime's supply of vitamins. There will also be canned goods with plenty of vitamin C. As others have pointed out, canned goods are guaranteed for 3-5 years, but will often last much, much longer. As pointed out earlier, if you aren't out working in the hot sun you don't need to drink that water directly, you'll get most if not all of it from the food. Lots of people seem to have swallowed the line about humans needing to "drink" 8 8-oz glasses of water a day but it just ain't true. Does the hypothetical supermarket sell alcohol? Yes! A great point. A large supermarket will have a lifetime's supply of alcohol if you are careful. You could preserve enough fruits and vegetables to last for a long time. I should say that I agree water would be the limiting factor in the long run, I just think that long run is a lot longer than some folks believe it is. You would be going through the potable water much more slowly than a gallon a day but you would go through it. Of course the entire exercise is an artificially constrained hypothetical anyway. There's no reason you'd be stuck inside one grocery store. Assuming you don't live in the middle of a desert you could stick rain collectors on the roof. Water should be no problem: build a solar still. Or a bunch of them. All you really need are containers (plenty in the supermarket) and a plastic sheet (if nothing else, can be constructed from Saran wrap). The long plastic tube is just a convenience. Better make the milk into cheese right away. (Rennet might be available in the store... a cheese press, maybe not. But surely you can improvise.) Cheese covered in wax will keep for quite a while. You can make simple cheeses with lemon juice or vinegar in place of rennet. These cheeses would be harder to preserve, but you could brine them to make a sort of feta. The median U.S. supermarket is 50,000 feet^2 (4,000 m^2), and carries about 1 unique item (SKU) per square foot. Assuming that 10% of the items are liquid, you're looking at 5,000 different drinks. Times 5 items in stock per item is 25,000 drinks. 40 years is a little less than 15,000 days, so you could have two drinks a day. That's not even taking into account the liquid in canned goods, which is substantial. Given that my estimate is conservative, I think you'd be fine. It's a shame the survivor can't access fuel and a generator, because I imagine storing some of the canned food in freezers would add considerably to its lifespan. 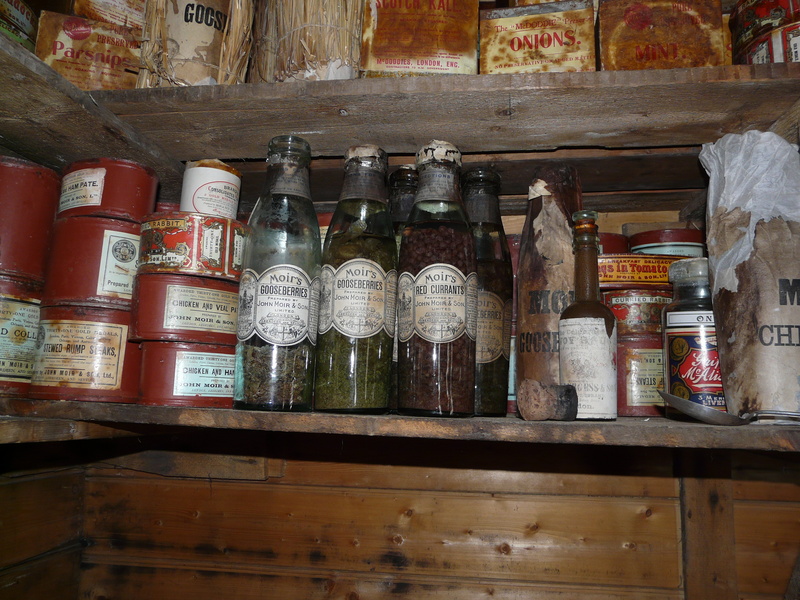 Thousands of items of Edwardian food, including tins of sardines, ox tongue, pâté, Heinz baked beans and biscuits remain stored in both Scott's and Shackleton's Antarctic cabins, and I understand that some of that food is still considered edible. See also: Port Lockroy. Dried meat kept dry will last essentially forever. One would have to get on with the drying immediately after the apocalypse but your average supermarket would easily have a life time supply of meat if it was dried. How to dry it would be problematic. It would need to be cut, salted and racked in the sun in relatively low humidity. thewalrus: "Even canned food will only be good for 3-4 years, after that, in a post apocalyptic scenario it would be a russian roulette of dying from some terrible intestinal ailment caused by food poisoning. Most everything else will spoil in between 1 week to 6 months." Canned food is edible well past it's expiry date but it starts getting unpalatable. Dried food properly sealed (use the CO2 available in those little cartridges or nitrogen if your supermarket sells tires) will last a long, long time. I imagine heavily processed food like poptarts are good for ever. gauche: "You can live on crackers and cookies and other shelf-stable carbs for a while, but you'll be depleting your stores of vitamins and trace minerals and so forth. You'll get, among other things, scurvy." Vitamins are available and scurvy at least can be kept at bay with lime juice. One of my concerns would be rickets from a lack of calcium. I'm not sure whether there is enough antacid to keep your bones healthy. There is unlikely to be enough stored water but one can solar distill urine back to potable water and that would greatly extend the stored water supply. I think a limiting factor might be the lack of dental care in said grocery store. Food is great and all, but if you're not visiting a dentist for cleanings/fillings, how long are those teeth of yours going to last? You're gonna burn through that baby food aisle, and then what—corn meal paste every day? There's a lifetime supply of floss, toothpaste, and toothbrushes. As long as you're rigorous about your dental hygiene you'd be good for a long, long while unless you're unlucky. What is the impact on lifespan of being without healthcare? Is this impacted if the supermarket has a pharmaceutical section? Remember that a lot of processed food is very high in salt. It may be wet, but it's not the sort of moisture that can replace water. Get a still up and you'll be golden, though. I'd say some serious composting of lost perishables (and hopefully sensible composting - keep the meat and eggs out of the heap, for a start) to get a food garden going on the roof will make a big, big difference. As for calcium, it's going to be found not only in your supplements aisle, but in the form of powdered and canned dairy (don't forget baby formula), shelf stable cheeses like Velveeta and the bones in tinned fish. As for your teeth, so long as you brush and avoid damaging them where possible, they aren't going to kill you in ten minutes. Dental care is a relatively new invention and most of the animal world gets by just fine without it. Not to mention the big aisle of toothpastes, powders and mouthwashes. Be thankful most grocery stores sell can openers. *Canned food: as others say, canned goods may have expiration dates 3-4 years from now, but yeah: most of it will be edible for a while after that. *Fluids: there's a lot of bottled water in the average supermarket, but that too has expiration dates, though water too will be useable for a while more, even though it'll start to taste of the plastic bottles. Bottled sodas, beer and other carbonated drinks will be flat in a year, and drink cans not much later..... flat and nasty, but drinkable. *Fresh foods: yeah, that's all going bad first. Maybe dry as much meat as you can and make jerky; ditto dried fruit. *Drugs and vitamins: more expiration dates, but these are expiration dates you should pay more attention to than on the canned foods or water. Some drugs merely lose their potency as they age, but others become dangerous. Don't forget to gather useful NON-food items: can openers, candles and Sterno, grills and charcoal, cooking pots and utensils. And if your survivor is sharing this supermarket with others, consider what you'd want to hoard for yourself/your family: all of the peanut butter and jams and canned meats like tuna have a lot of protein. I think your main problem in an apocalypse would be that everyone would go straight to the supermarket to loot what they could. Some of them, especially those with children to feed, would be willing to kill someone (you) who tried to claim the whole store for themselves. However, most grocery stores do not sell canning equipment, so that would affect the ability to preserve/can food, unfortunately. If you do luck out and are in a grocery store that also stocks mason jars, you can preserve a lot of the produce - and you can re-use two of the three components of a mason jar, so you can even go for a couple years of growing things so long as you've got enough of the lids. Would your hypothetical person be required to reside inside the supermarket, and permanently remain there? Or would they be able to leave and live outside the supermarket, start a garden in the front yard, etc., and simply use the supermarket as a food storage facility? I've noticed a lot of people are assuming that your survivor would be living there and never allowed to leave, and I'm noticing that you haven't specifically stated that. The "8 glasses a day thing" is a myth. More about that. Also, while caffeinated beverages do have a diuretic effect, that effect does not cause you to lose all of the hydration of those drinks, only part of it. A lot depends on the age of this adult and other factors. It seems unlikely that 20 year old is going to live until 90 living in a grocery store following a nuclear fallout - even if there is plenty of food, they will be living with additional risks and no or limited health care and human contact. And a lot depends on the grocery store. A suburban Whole Foods would be different from an NYC bodega. And then there's the survivor. Are they smart enough to ration from the start? Can they rig up a way to cook, which would allow them to use stuff like oatmeal? Is there any chance at all this store has a generator and this survivor can figure out how to use it and keep it going for a while? My town of about 20,000 has two good sized suburban grocery stores (but not mega sized) plus a trader joe's plus miscellaneous specialty stores. Assume cross buying to/from neighboring towns is a wash, ignore smaller stores, ignore water, ignore spoilage. Assume that each of the two stores has more than sufficient inventory to last a single average day. That gives us 10,000 person days capacity per store = 27 years as a conservative lower bound. Only marginally related to reality because of the "ignores", but within an order of magnitude consistent with some of the other estimates. I have actually done a fair amount of thinking about this. My nomination for best supermarket to survive the apocalypse in is this Stew Leonard's between the Saw Mill and 87 in Yonkers. It's right next to a Home Depot and a Costco, AND it's high up on a hill, making it fairly defensible. I think this complex could support a small community for many years. I expect one of the top priorities for the leader right away would be to take advantage of the confusion and go on the offensive. If you could secure the whole strip mall, including hardware store and gas station, you could get generators and fuel and get the refrigeration restarted in the supermarket. Kitchen facilities in the Chili's in the parking lot would be convenient, too. You're going to need that hardware store to make defenses; that big front supermarket wall of glass isn't going to be your friend once all the have-nots remember the supermarket. Maybe your question was disregarding this, but your limiting factor is not water at all. It's scarcity and the resulting need for security. Maybe YOU could live a long time, but only if you find a way to not have to share with the entire town. I meant to say, initially limited by canned goods, then extension would vary entirely based on your knowledge of things like preservation, etc. Sounds like some here could last a lot longer than I could, because I'd be down to the canned goods pretty quickly. Choose me for your team anyway, though. I'm good at organizing the work force, security, and figuring out solutions to your engineering problems. Mitheral: " One of my concerns would be rickets from a lack of calcium. I'm not sure whether there is enough antacid to keep your bones healthy." If the store in question is a superstore, I would consider that they have a pharmacy, and with all the time in the world (and tools from the hardware section) to break into the pharmacy, they'd have access to any prescription-only supplements on hand, like potassium and magnesium and calcium. You can buy all of these things off the shelf, can't you? At least in the USA. But you'll still need the pharmacy for diabetes medication due to eating those 5 to 10 million calories of granulated sugar. However, most grocery stores do not sell canning equipment, so that would affect the ability to preserve/can food, unfortunately. They have plenty of stuff in reusable glass jars and bottles, as well as oil, salt, sugar, acids and dried spices for preserving. Heating would be trivial with heat beads / empty boxes, matches / a plastic bottle / magnifying glass, a saucepan and bottled water (which you can drink afterward, having boiled it). Look after the health food aisle - it's full of long-lasting dried goods (like lentils). How long does protein / whey powder / dried milk powder in a pack last? Dried noodles and pasta? What if you take the dessicant packets out of some food items as you eat them and add them to other foods, like rice? The glass jars most things come in can be re-used, but not re-sealed. The specific kind of lid used in home canning enables the user to create a vacuum seal with simple equipment, and it is that vacuum process which lets the home canner keep foods shelf-stable for extended periods of time. Obi-Wan Wasabi, you might like the PBS reality series' Frontier House, if you can find it anywhere (it aired circa 2002 and might not be available streaming). A race to prepare for the winter wasn't the explicit premise, but it was one element, and there was an entire episode at the end of the run about each family and whether they would have survived the coming winter. And re canning -- my local supermarket carries mason jars for canning. Not a ton of stock (and I think you'd run out of extra lid inserts pretty quickly), but you could get a start. The glass jars most things come in can be re-used, but not re-sealed. My re-used jars with re-used lids seal just fine. Heat, cool, middle of lid pops down. Open lid, middle pops up, contents are fine. For how long? Has something been shelf-stable for a couple years that way? Actually, we're getting away from the OP's question, my apologies; but if the OP could clarify whether the people trying to live off the supermarket can PHYSICALLY LEAVE the supermarket, or if they have to stay within those four walls or on the roof? That could also make a difference in terms of what can be done to/with the food in it, and that could affect how long you could live off the food in it dramatically. I don't know enough about food preservation, but how much food could someone actually preserve, by themselves, without any labor-saving electrical tools and with limited heating capabilities, before the food they're trying to preserve goes bad in the first place? Flunkie: "You can buy all of these things off the shelf, can't you? At least in the USA." The short answer is yes, in small doses in multivitamin form. But not as individual supplements. Speaking only to my Walmart pharmacy: Magnesium (Mag64) is non-prescription, but is kept behind the counter. My mom takes it because she is on Lasix. We just walk in and ask for a bottle. When I was in the ER with low potassium recently, they prescribed Epi-Klor powder which required a prescription. My mom takes Klor-Con potassium pills which are also prescription. You can certainly buy vitamins that have small amounts of potassium and magnesium in them off the regular shelves, but not the prescription strength. I calculated how much potassium was in my prescribed pills vs multivitamin - the prescription was 20mEq and the vitamin was 14mEq, IIRC. (I was required to take the Epi-Klor twice a day and then after I stopped that, the multivitamin once a day.) I don't know about calcium... I've never spent time looking in the supplement aisle for calcium supplements. I would suspect you can't just buy large quantities of potassium, or potassium-only supplements, without a prescription because too much can stop your heart. It is, in fact, one component of the drugs used in lethal injection, or has been in the past. (Read more on Wikipedia if you're interested.) It has to be given slowly when given via IV to prevent this. Regarding Mitheral's question of needing calcium to stave off rickets, my multivitamin does contain calcium, as well as the magnesium and potassium, so even barring breaking into the pharmacy, the person in question would likely be fine with just multivitamins off the shelf. But if the person needed additional amounts of individual supplements (let's say (s)he's a doctor), there's the pharmacy. Regarding the diabetes medication, I realize there are pill-form medications, but insulin generally requires refrigeration and doesn't last long, especially once opened. I'm eating summer of 2010/11's zucchini relish with cheese and crackers now, and the lid popped when I opened it on the weekend, so yes.